Before being called the Seoul Dynasty, In-jae “EscA” Kim, Jin-hyuk “Miro” Gong, and star player Je-hong “ryujehong” Ryu participated in the 2016 Overwatch World Cup for team South Korea. They made a huge impression among fans, though they were already expected to win the World Cup that year. No team could make a dent in South Korea as they went 3-0 in the group stages. In the playoffs, they remained undefeated, taking out teams like the United States, Sweden, and Russia. During that year’s Blizzcon, Blizzard announced the formation of the Overwatch League. After that year’s World Cup, those three players set their sights past the World Cup and prepared to dominate all of South Korean Overwatch. Created in 2016, EscA, Miro, and ryujehong formed Lunatic-Hai. From there, they met their support, Jin-mo “tobi” Yang. Together, they ran the Overwatch scene in South Korea. Eventually. In the first season of APEX, Lunatic-Hai didn’t exactly live up to expectations. It could have been the nerves or their lack of experience (this was their first stint in a premier event,) but Lunatic-Hai placed tied for 5th. They were eliminated by Kongdoo Uncia, lead by future Overwatch League champion Ji-hyeok “birdring” Kim. After their premature elimination in APEX Season 1, they had to rebound. Season 2 of APEX was a few months away. They made a roster change, substituting Geum “dean” Dong-geun for Joon-hyuk “zunba” Kim. Going into APEX Season 2, they were definitely not favorites. EnVyUs were Season 1 APEX champions, and many assumed they would continue their dominant run in Season 2. As the season went on, though, they generated hype as they started winning games. Lunatic-Hai redeemed themselves of their mediocre Season 1 and became Season 2 champions against a new, up-and-coming team called RunAway. Lunatic-Hai became the favorites in every tournament they participated after their Season 2 championship. They won Season 3 of APEX against the juggernauts, Kongdoo Panthera. Prior to Season 4 of APEX, KSV (now Gen.G) Esports announced their acquisition of a Seoul team for the Overwatch League. They also announced their acquisition of Lunatic-Hai, but allowed Lunatic-Hai to fulfill their obligations for Season 4 of APEX. This announcement put a lot of pressure onto Lunatic-Hai, and that pressure showed. Season 4 ended just as Season 1 did – tied for 5th place. They regained their confidence after capturing 1st place in the OGN Super Match over Cloud9 Kongdoo, cementing Lunatic-Hai as the best team in South Korea once again. Their aspirations, however, laid beyond South Korea. KSV Esports gave Lunatic-Hai a new identity. Before the newly minted Seoul Dynasty started preparations for the Overwatch League, South Korea defended their title at the 2017 Overwatch World Cup 2017. That roster featured returning players ryujehong and zunba, along with their teammate tobi. The World Cup also introduced the worldwide audience to Jong-ryeol “Saebyeolbe” Park, Dong-gyu “Mano” Kim, and Yeon-oh “Fl0w3r” Hwang. South Korea conquered the World Cup once again, becoming back-to-back champions. South Korea’s championship win in the Overwatch World Cup, helmed largely by members of the Dynasty, once again marked Seoul as the favorites to win Overwatch League Season 1. To prepare for the season, the Dynasty acquired former Cloud9 off-tank Jae-mo “xepheR” Koo, welcomed back DPS Sang-beom “Munchkin” Byeon, and traded for Flash Lux’s DPS Byung-sun “Fleta” Kim. In-jae “EscA” Kim announced that his retirement from Overwatch to focus on PUBG, though he remained with Gen.G Esports. Replacing EscA was Seok-woo “Wekeed” Choi from LW Red. Joon-hyuk “Bunny” Chae was promoted from their secondary roster. Lastly, they acquired main tank Dae-kuk “KuKi” Kim from MVP Space. Seoul Dynasty had all the pieces necessary to win multiple stages, and a strong chance to win the inaugural season championship. The question was whether or not their potential would translate onto Overwatch’s biggest stage. The Dynasty had an undefeated preseason, and confidence rose for Seoul heading into Stage 1. They started Stage 1 with a 5-game winning streak… until their first meeting with the New York Excelsior. In a highly competitive 5-game set, the Dynasty came close, but couldn’t clutch it out. After that loss against NYXL, things just weren’t the same. The Seoul Dynasty finished Stage 1 with a record of 7-3. Stage 1 showed that the Dynasty didn’t hold onto the same identity and feel as when they were Lunatic-Hai. Their slump continued in Stage 2, and through the rest of the season. In Stage 2, Seoul barely missed playoffs again, losing their spot to the Philadelphia fusion, who tied their game record, but had a better map differential. Desperate for a solution, the Dynasty made a move prior to Stage 3. Seoul released Bunny at the end of Stage 2, and gambled with a familiar name – Heo “Gambler” Jin-woo. Despite switching things up in the front and back line, these roster moves didn’t fix what ailed the Dynasty. Seoul finished Stage 3 at 5-5, and Stage 4 at 3-7. The inaugural season was a memorable one for the Dynasty, but not for the reasons they would have liked. They struggled to find the cohesion they had had in APEX and prior World Cups. The once-mighty Lunatic-Hai did not start a dynasty in the Overwatch League. The Dynasty need to make changes in the offseason. The first step to reclaiming their throne is a staff overhaul. The Dynasty’s coaching staff in Season 1 was composed of Kwang-jin “beast” Baek, Ho-jeong “alwaysoov” Chae, Yo-han “nuGget” Kim, Yoon-ho “Bubbly” Cho, and Ho-cheol “Hocury” Lee. That meant the team had five voices in their head, instead of one centralized coach. The Dynasty released their coaching staff in mid-July, with Hocury transitioning into a General Manager position. Speculation currently lists former London Spitfire coach Chang-Geun “Changgoon” Park and former Mosaic Esports/6nakes coach Donggun “KDG” Kim on the Dynasty’s new coaching staff, though the exact nature of their work with the Dynasty is unknown at the time of publication. Aside from their coaching issues, the Seoul Dynasty also struggled with underperforming players. Lunatic-Hai was a team that the meta favored due to the prevalence of dive comp. As the Overwatch League got underway, though, dive comp quickly fell out of favor. The meta moved towards comps centered around protecting Mercy — before and after her rework. The meta also shifted significantly towards support players flexing heavily towards the end of the season. With the nature of tank play shifting so drastically over the course of the season, it was clear that the Dynasty’s tanks just couldn’t keep up. Things got so desperate for Seoul that Ryujehong moved into the role, instead of his famous specialty in main support. 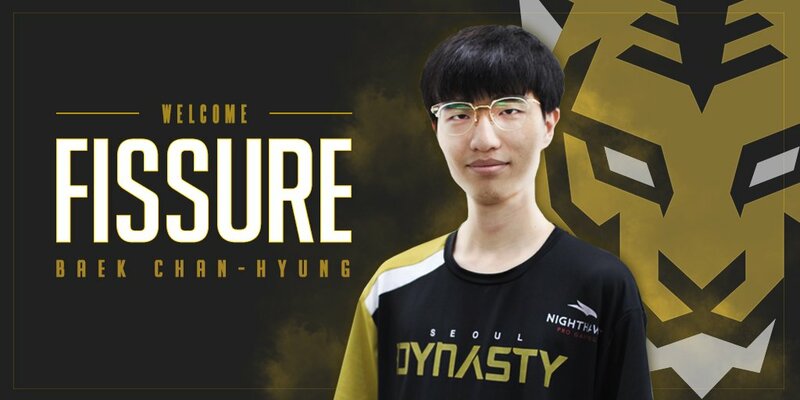 The Dynasty have (hopefully) found a solution to their tank problems by acquiring Chan-hyung “Fissure” Baek. Fissure has always played exceptionally well for the teams he’s been a part of, whether that was C9 Kongdoo, the London Spitfire, or the LA GLadiators. Those consistent performances earned him a healthy consideration for Season 1 MVP, and generated plenty of hype around his play. A tank like Fissure is just what the Dynasty need. Fissure is adaptable and mechanically capable, and he should have no trouble shot-calling on an all-Korean roster. Fissure had previously stated that he preferred being part of a team with a unified language – now he has what he wants. With Fissure on the roster, the Seoul Dynasty is slated to once again be one of the most hyped teams of Season 2. Aside from his great Reinhardt plays, Fissure was the highest rated Winston player in Season 1 (comparatively, Miro was ranked 6th according to ESPN Esports.) If they can fit one more piece in the puzzle, I firmly believe they can be the best team in the league. How, you ask? The Seoul Dynasty has a lot to prove – not only for themselves, but also for the fans back home. New York Excelsior and London are quickly winning Korean hearts and minds with their stellar performances and all-Korean rosters, but Seoul has struggled to get that first part down. And if Korean Contenders team RunAway joins the Overwatch League, then the Dynasty would quickly find themselves overshadowed. Look for the Seoul Dynasty to make huge moves heading into Season 2. It’s time for them to show the rest of the Overwatch League what made them a team worth fearing.